Though bread pudding is typically a dessert, we love this savory take with the addition of roasted parsnips. 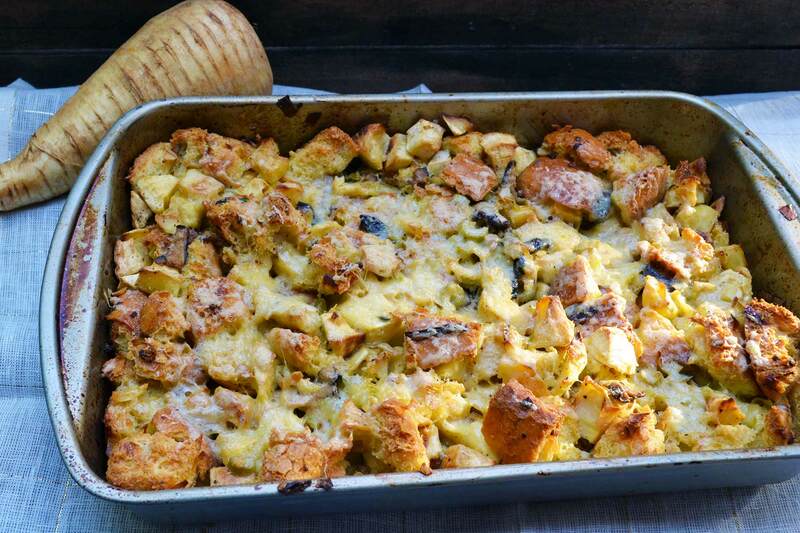 Slightly sweet and a little bit earthy, they give this savory bread pudding a new dimension. The best part about this dish is the crustier the bread, the better. If you have a loaf of French bread (or even half a loaf) that set out and is stale, this would be the perfect dish. Preheat the oven to 400 degrees Fahrenheit. Place the cubed parsnips on a baking sheet and drizzle with olive oil, salt and pepper. Roast for 20-25 minutes, stirring a few times while cooking. Remove and set aside. Turn the heat down to 375 degrees Fahrenheit. Heat the butter in a saucepan over medium heat. Cook the mushrooms for 3 minutes, until softened. Add the celery, leek and garlic and cook 1-3 minutes, until softened. Pour in the wine and cook until absorbed, about 1 minute. Add the fresh thyme and parsnips and stir to combine. Remove from heat. In a large mixing bowl, whisk the eggs, milk or cream and Parmesan. Season with salt and pepper, then add the mushroom mixture. Add the bread and stir until evenly coated with the egg and cream mixture. Pour the bread pudding into a greased casserole dish and bake uncovered for 45 minutes, until golden brown.